Lift your child’s creativity to new heights with Color Blanks. Color Blanks allow your child to engage in creative fun by designing their own plastic characters using stickers, mini markers and more. Using a blank canvas, you child can create their character, play with it or display! This activity set features one or two collectable, poseable, plastic figures, various colorful stickers and mini markers. 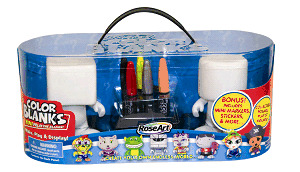 Your child can create their own endless world of Color Blanks by collecting all six figurines.